Self-Watering Tomato Plant Workshop on Saturday! Want to grow your own tomatoes in the middle of winter? Friend Darr will lead a workshop on how to grow self-watering tomato plants on Saturday, January 5th, 2013, at 2pm at Milagros Coffee House on the corner of State and Main in Alamosa. Each participant will take home a self-watering tomato plant. 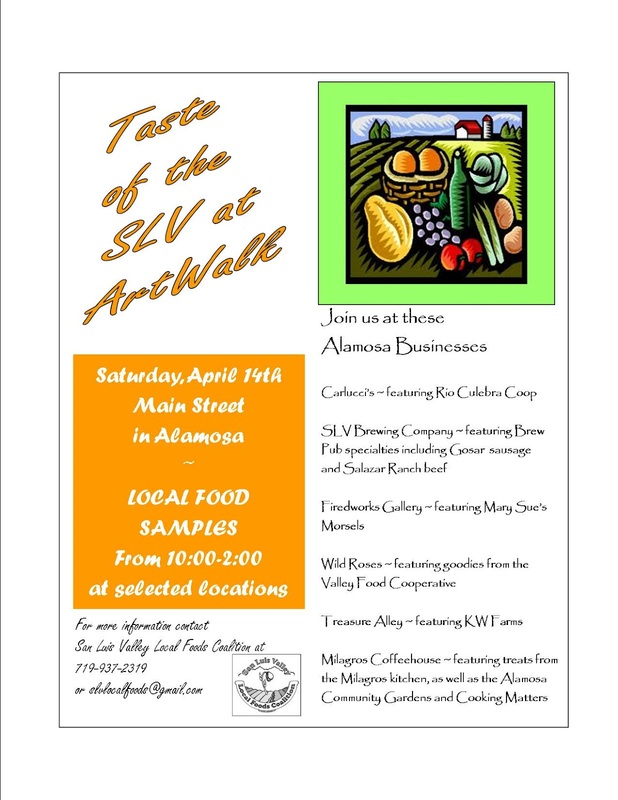 This workshop is sponsored by the SLV Local Foods Coalition. The cost for the workshop is $8. Space and materials are limited so participants must register by calling The SLV Local Foods Coalition at 719-937-2319 or emailing slvlocalfoods@gmail.com. The distinct flavors of the San Luis Valley are showcased on this scenic winter train ride as a chef prepares locally inspired dishes from area farmers and ranchers. 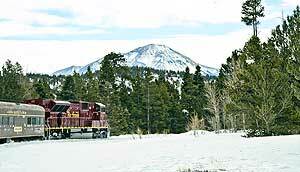 TEnjoy the spectacular winter scenery from the warmth and comfort of a train car as you travel from Alamosa to the quaint mountain town of La Veta. TPartake in local foods and drinks provided by Valley growers and brewers. TSupport the work of the SLV Local Foods Coalition, a nonprofit working to promote a sustainable local food system. TGuest speakers will be on hand to share their experiences with ranching, farming, beekeeping, seed saving and the value of eating locally. For ticket information go to www.riograndescenicrailroad.com or call 877-726-RAIL. A portion of each ticket purchased will go to benefit the SLV Local Foods Coalition. VALLEY — Eaters across the Valley celebrated National Food Day on Wednesday thanks to collaboration between local farmers, school food service directors and the San Luis Valley Local Foods Coalition (SLVLFC). Brothers Brendon and Sheldon Rockey, Rockey Farm, and Amy Kunugi, general manager of Nature Fresh Organics, both of Center, donated fingerling potatoes and organic carrots to nine school districts participating in the movement toward a healthier, more affordable and sustainable food system in the United States. SLCLFC volunteers delivered the two tons of tubers and roots to each district’s kitchen where food service directors had to clean, cut, chop, season and cook the spuds to make the special meal possible. The SLVLFC made sure each student new where the food was coming from. The group created Know Your Farmer posters that were hung on the lunch line while the fresh vegetables were being served. Joni Bilderbeck, Alamosa Food Service director, has been working with Nature Fresh for several years and was excited to get the yellow gourmet fingerlings from Rockey Farms. 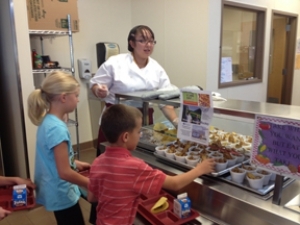 It takes her and her crew approximately a half-ton of potatoes and carrots to feed the district’s students. “They loved the potatoes and carrots,” she said. Food service directors Sarah Hurtado, Centennial School District; Bernice Archuleta, Sierra Grande School District; Tami Tims and Gloria Gutierrez, Monte Vista School District; and Cindy Archuleta, Mountain Valley School District all participated in the Farm to School event. Kunugi is very proud of Nature Fresh and its sister farm, Southern Colorado Farms, both of which she manages just north of Center. “We are growing vegetables in the middle of potato country while practicing sustainable agriculture,” she said. To Kunugi, this means maintaining the land and the health of the labor force. “We are constantly trying to improve the land and quality of life for people working the land so it will be here for future generations,” she said. She added that she is willing to donate organic carrots to the schools like she has been for several years because she believes children should be eating lots of nutrient-dense foods. She said she believes fresh food is better. It is healthier, contains more of its nutrients and it tastes better, which is the key. Fruits and vegetables that land in the school trash don’t add much nutrition to the students’ health. At Rockey Farm, they decided to give up the ‘cides (fungicide, herbicide, pesticide) in favor of creating a balanced soil health. As a result, costs and water usage have gone down and the quality of the products has gone up. Innovation is in the Rockey family. Floyd and Vera Rockey bought land in 1938 and were known for farming and their chickens, eggs, milk and cream deliveries. Their son, Warren Rockey, earned a degree in agronomy at CSU and did a tour of Vietnam. He came home wounded to run the farm. Warren had a 100 sow hog operation and grew the land under production to four circles. His brother Verlin got a degree in physics and after working at White Sands for many years as an analytical engineer returned back to the land to help his brother farm. Sheldon and Brendon both graduated from Center High School while running center pivots with their uncle. Their father insisted on a higher education, so Sheldon went to Colorado State University to get a degree in agricultural engineering, and Brendon followed with a degree in horticulture. In 1993, in response to White Mountain Farm of Mosca’s desire to grow certified seed fingerlings, the Rockey family brought fingerling potatoes in from Europe. Cornell University helped them with the first batch of clean tissue culture. They grew the tissue culture plantlets in the greenhouse and then it went out into field. The Rockey outfit was the first in the United States to do this. Their specialty potato business is still a successful and they have just recently partnered with White Mountain Farm to create a new packing facility in the former Sangre de Cristo Middle/High School building..
of Cho ku rei Ranch in Crestone. Join us for an upcoming workshop on making goat cheese offered by the Food Preservation Committee of the Local Foods Coalition. The workshop will take place Saturday, October 13 at 10am at the Mountain Valley School in Saguache and will be taught by Laura Archuleta. There will be an $8 fee to cover materials and all participants will be able to take home some cheese! Please bring a dish to share for lunch. Participants should RSVP to Liza Marron at 587-1034 by the end of the day on October 11. Join us for an upcoming workshop on Fermenting Food offered by the Food Preservation Committee of the Local Foods Coalition. The workshop will take place on Thursday September 20th at 7pm at the Center School. One of the benefits of fermenting is that it is an inexpensive way to store a raw food with enzymes throughout the winter months. During the workshop, nutrition educator Elaine Patarini will be discussing various forms of fermenting and will focus on making a quart sized jar of fermented veggies for participants to take home. There will be a $5 fee to cover materials. If you would like to attend, please let us know as soon as possible so that we can have supplies for you. You can email nutritioned.slvlocalfoods@gmail.com or call or text 323-842-5121. Here it is- the beautiful, new Local Roots guide- soon to be showing up in your community! Thanks again Pauline Washburn! You are an amazing editor and we couldn't have done it without you! 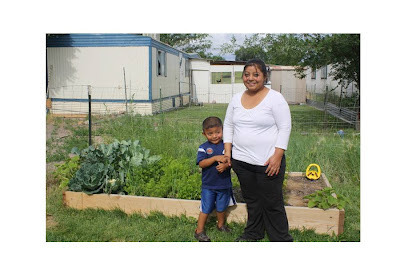 SLV Local Foods Coalition and the Alamosa Community Gardens are offering a workshop on “How to Build a Cold Frame” on Saturday September 8th at 2pm at the Boyd Community Garden on 11th and State Ave in Alamosa. Local farmer and builder, Friend Darr, will be showing us how to build an unheated outdoor structure with a frame and a clear glass or plastic top that can be used to protect and acclimatize seedlings and plants. These structures can help to extend our short SLV growing season. This workshop is a part of the Food Preservation Committee of the LFC and their efforts to address the challenges of eating locally year round in the SLV. A fee of $6 will cover costs of materials (scholarships are available). For more information email slvlocalfoods@gmail.com or call 719-587-1034. Join us for this year's Food Preservation Series! Sunday August 26th- Pressure Canning with Marianna Young 2-5pm in Monte Vista Church of the Nazarene just west of Safeway. $10 fee covers class materials, a donation to the church and a jar of veggies to take home. RSVP to Liza Marron at 587-1034 by August 24th. 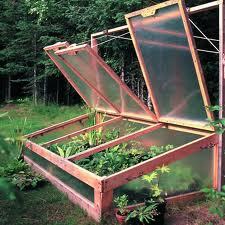 Saturday, September 8th- Cold Frame Building Workshop with Friend Darr at 2 pm at the Boyd Garden in Alamosa. $6 fee. Thursday, September 20th- Fermenting Food with Elaine Patarini at 7pm in Center Center School Cafeteria - $5 fee. Saturday, October 13th- Goat Cheese Making with Laura Archuleta at 10am followed by a potluck lunch at Mountain Valley School in Saguache. $8 fee. RSVP to Liza Marron at 587-1034 by October 11th. 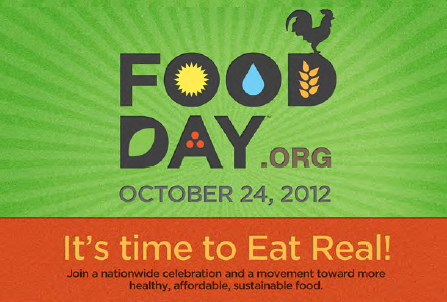 Wednesday, October 24th- International Food Day Celebration- Details to be announced!! There is no Local Foods Coalition meeting in July and there are no Committee Meetings in July. We will resume our regular Coalition meeting schedule in August. But, in the meantime, here are some upcoming workshops and trainings for cottage food producers, educators, farmers, ranchers and foodies!
. this Saturday at 9AM. If you are able, bring a potluck dish to share for lunch, as well as gloves, water and sun protection. For more info call Jenna or Meghan at 719-589-4567 or email alamosacommunitygardens@gmail.com. If you would like to sell prepared foods at a farmers market or direct from your farm check out this webinar: So You Want to be a Cottage Food Producer? Wednesday, July 11, 2012 – 6:00-7:15 pm. Learn the basics of Colorado’s Cottage Food Act and how to start a home-based food business, including: eligible products; potential markets; food safety training requirements; licensing and registrations; insurance information; and potential costs and returns for your business. To join this webinar, click on http://connect.extension.iastate.edu/colofood 5 minutes prior to webinar. Click on “Enter as a guest,” type your name, then click “ok” to enter the webinar. Audio will be over the internet. The webinar will be recorded and the link will be posted several days following the webinar at: http://cofarmtomarket.com/value-added-products/cottage-foods/ . Denver Urban Gardens is offering a workshop on Organic Gardening for Youth Educators, July 11 . This unique workshop is designed for teachers and volunteers who work in youth education programs that focus on nutrition and gardening. Join DUG’s Education Team to learn different ways to use your school garden and how to teach hands-on lessons in organic gardening and nutrition. You don’t need to be an expert horticulturalist to teach gardening to youth, but having a foundation of Colorado-specific gardening knowledge benefits both youth and educators, building confidence and skills. This half day intensive workshop is for educators who would like to learn more about horticulture in order to make their garden lessons more effective and meaningful. In this workshop we will cover the basics from choosing plants, companion planting, spacing, pollination, harvesting, using garden produce, troubleshooting insect and disease problems, composting and watering. All subjects will be discussed in the context of youth education in school gardens. For more info see www.dug.org. The Amazing Joel Salatin will be in Colorado Springs for an all day seminar on August 4th at A Joyful Noise Farm in Colorado Springs, CO. Local food advocate and author Joel Salatin will be the featured farmer at the 2012 “Follow the Farmer” seminar at A Joyful Noise Farm in Black Forest. Mr. Salatin will spend the entire day lecturing and leading walking tours of a working small farm. 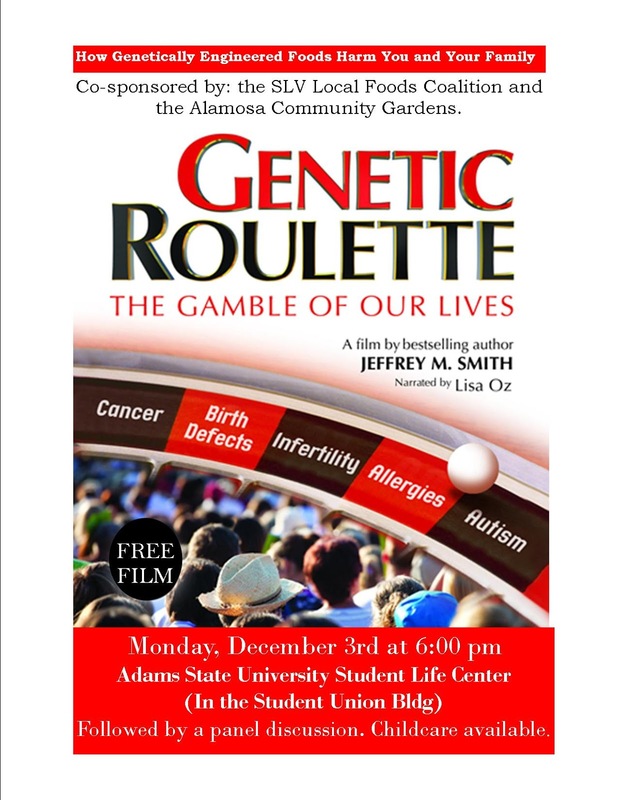 Salatin and his farm, Polyface Inc., have been featured in the book "Omnivore's Dilemma" and the documentaries "Food Inc", "Fresh" and "Farmageddon". Price: 130.00. Phone: (719) 357-9410 Space is limited to 100 participants. Breakfast, lunch and a syllabus are included in the price. See www.ajoyfulnoisefarm.com for more info. Holistic Management “Whole Ranch Planning” Series offered by the Southwest Grassfed Livestock Alliance (SWGLA). Internationally renowned consultant and holistic management expert, Kirk Gadzia, will be teaching this unique learning series. With the specific goal of assisting grass-fed livestock producers to increase the economic viability of their operations, this 8-day course will cover effective business and marketing planning, grass-fed/holistic production methods, maximization of resources and wholesale/retail marketing opportunities. This will include both classroom time and field days at participating ranches throughout New Mexico. Four separate 2-day sessions will begin in late summer of this year and conclude in spring of 2013. A recently awarded grant from USDA/Western Risk Management Education allows SWGLA to offer this course at a significantly reduced fee. This is a unique and affordable opportunity, appropriate for grass-fed producers, ranchers considering a transition to grass-fed and all others interested in developing more economically viable ranching & holistic resource management. For more information, contact SWGLA Director Laurie Bower at info@grassfedlivestock.org or (970) 390-5597. AND Mark your calendars for the 11th Annual Quivira Coalition Conference: How to Feed Nine Billion People from the Ground Up: Soil, Seeds, Water, Plants, Livestock, Forests, Organics, and People, November 14-16th, in Albuquerque, New Mexico. Global human population is projected to reach nine billion by 2050, which means food production will need to expand by 70% to keep up. Fulfilling this demand will place unprecedented pressure on ecosystems, including the planet's grasslands, especially as competition grows for scarce natural resources. How to meet this daunting challenge while ensuring the health of land, water, wildlife and people will be one of the great tasks of the 21st century. In this conference, we will explore a variety of innovative practices that are already successfully intensifying food production while preserving, maintaining, and restoring the natural world. Speakers will share their hands-on experience and ideas for feeding all life - from the ground up. 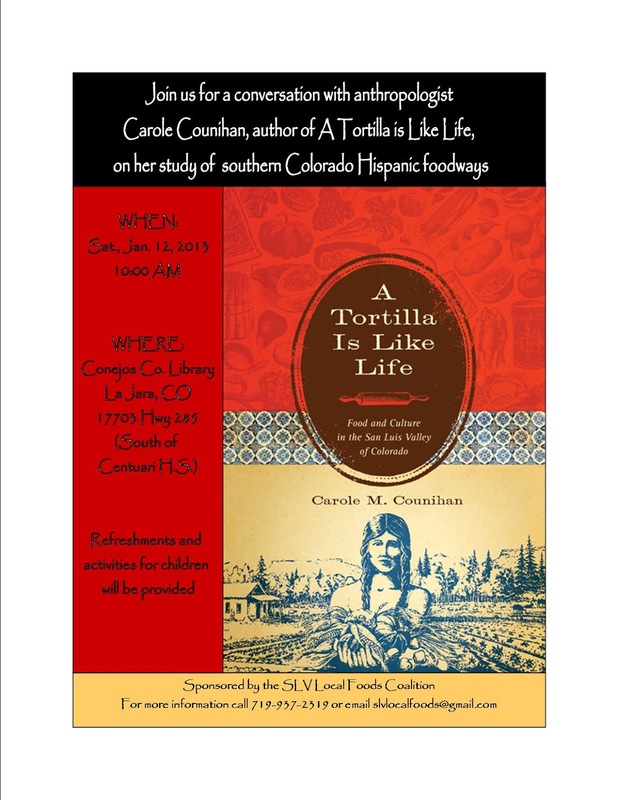 For more info go to www.quiviracoalition.org. Congrats to our new Healthy Habits Coordinators: Renee Mackey and Cheryl Stokes at the Alamosa Farmers Market and Lisa ter Kuile at the La Jara Farmers Market! Soon we will also be announcing our new Cooking Matters Coordinator. And if you are looking for a weekend job, we still have an opening for an On-Site Manager at the Alamosa Farmers Market (see the earlier post). So, there is a lot cooking at the Local Foods Coalition- literally! 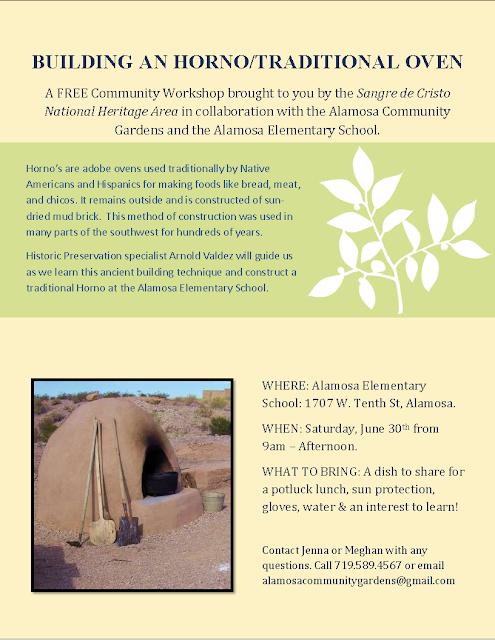 Learn How to Build a Horno! See below for job descriptions for P/T, Temporary Healthy Habits Coordinators for the Alamosa and La Jara Farmers Markets. If you are looking for the F/T Cooking Matters Job Description see the May 25th post. o Contact and schedule potential guest chefs, providing them guidance on selecting their recipe and submitting it in advance of his/her assigned Saturday. o Work at approximately seven of the 14 Saturdays during the Alamosa Farmer’s Market from 7:15am to about 2pm. The Market runs from July 7-Oct 6.
o Purchase weekly demonstration supplies including food, based on the recipe being prepared that week. · Passion for nutrition and cooking education. · Basic knowledge in the preparation of nutritional foods, including safe food preparation methods. · Ability to lift 50 pounds. · Hourly rate of $12 for approximately 8-12 hours per week. Submit and resume and letter of interest to Megan Lehnerd at slvlocalfoods@gmail.com by Friday, June 15 at 5pm. For questions contact Megan via email or at (719)937-2319.
o Contact and schedule potential guest chefs, providing them guidance on selecting their recipe and submitting it in advance of his/her assigned Friday. o Work the seven Fridays of the La Jara Farmers Market from 2:30pm-about 7pm. The Market runs from July 27-Sept. 7. · Hourly rate of $12 for approximately 5-10 hours per week.